Secretary-General Ban Ki-moon (C) flanked by Joint Special Envoy, Kofi Annan (L), and Secretary-General of the Arab League, Nabil Elaraby, speaks to press. At the request of the Security Council, Secretary-General Ban Ki-moon will soon put forward a range of options for resolving the crisis in Syria. The Secretary-General – accompanied by the Joint Special Envoy of the United Nations and the Arab League for the Syrian Crisis, Kofi Annan, and the Secretary-General of the League of Arab States, Nabil Elaraby – was addressing the media following a briefing to the Council on Syria. Earlier in the day, the three men had addressed an informal meeting of the General Assembly on the same topic. The UN chief said the upcoming summit of the Group of 20 on 18-19 June in Los Cabos, Mexico, will provide an important opportunity to discuss the crisis in depth. The six-point plan calls for an end to violence, access for humanitarian agencies to provide relief to those in need, the release of detainees, the start of inclusive political dialogue that takes into account the aspirations of the Syrian people, and unrestricted access to the country for the international media. Secretary-General Ban said that along with Joint Special Envoy Annan and the Arab League’s Secretary-General Elaraby, he has seen little evidence of the Syrian Government complying with its commitments under the six-point peace plan, while at the same time, the opposition is hardening and turning increasingly to arms. Noting that the killings in Syria over recent weeks is indicative of a pattern that may amount to crimes against humanity, the UN chief said the confrontations in certain areas of the country have taken on the character of an internal conflict, subject to international humanitarian law and possible war crimes prosecution. In late May, more than 100 men, women and children were massacred in the town of Houla, and earlier Thursday, there were reports of large-scale killings in the village of Mazraat al-Qubeir, near Hama. Observers with the UN Supervision Mission in Syria (UNSMIS) have been trying to verify the latest massacre reports – but have so far been obstructed in their attempts. “The League of Arab States has, starting last July, pressed on the Syrian leadership the need to stop the fighting. Nothing has happened. We have tried many things, including deploying observers. Nothing has happened again. Now it is in the hands of the United Nations,” Mr. Elaraby said. He noted that as the Security Council is the principal international organ vested with the primary responsibility for the maintenance of international peace and security, adding that was up to the Security Council to take action now. Following the press encounter, Ambassador Li Baodong of China, which holds the Presidency of the Security Council for the month of June, told the same group of journalists that the 15-member Council is behind Joint Special Envoy Annan’s mediation efforts. 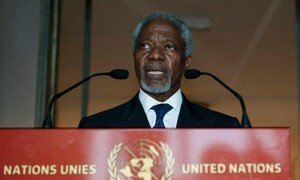 “The Council reiterated its full support to Kofi Annan’s efforts and also to his six-point peace plan, and urged full implementation of Kofi Annan’s six-point peace plan and UN Security Council resolution 2042 and 2043; and, in particular, the cessation of all violence without delay,” Ambassador. Li said. He also expressed the Council’s full support for UNSMIS, which is deployed around the Middle Eastern country to monitor the cessation of violence in Syria, as well as monitor and support the full implementation of the six-point peace plan. The Council’s resolutions 2042 and 2043 dealt with the deployment of monitors, including those of UNSMIS, to Syria.